By Brian Voo in Concept. Updated on November 14, 2017 . Ingenius architects and pretty talented interior designers have turned spaces, apartments & lofts as small as 240 square feet into compact yet cozy homes. 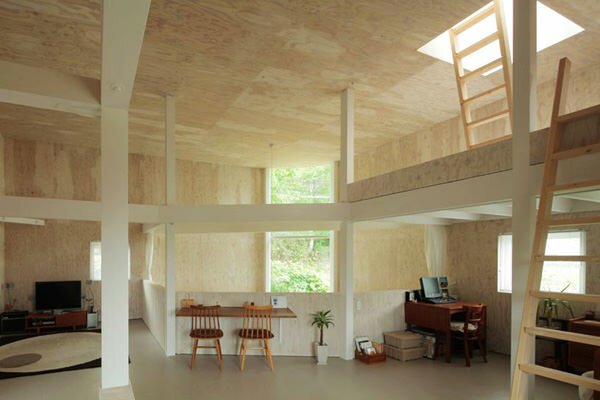 Most of them utilize ‘airspace’ or create multiple, moveable sections to transform an otherwise small living space into a full range (somewhat) multi-room home. These creations are sure to make you rethink home modeling. Living Cube. 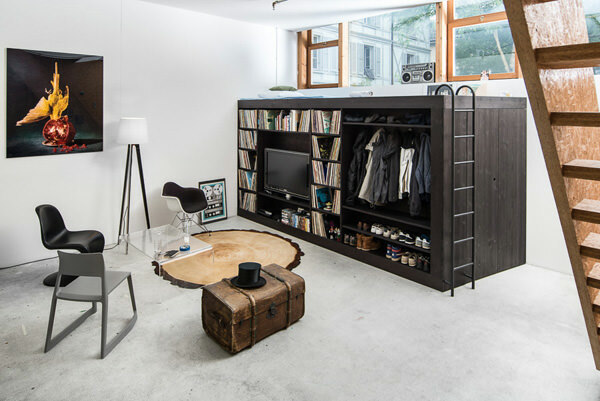 The Living Cube looks like a modern twist to a bunk bed only instead of another bed, it has a nice clean storage compartment to house your TV, DVD or book collection and your clothes. 29 Square Meters Project. 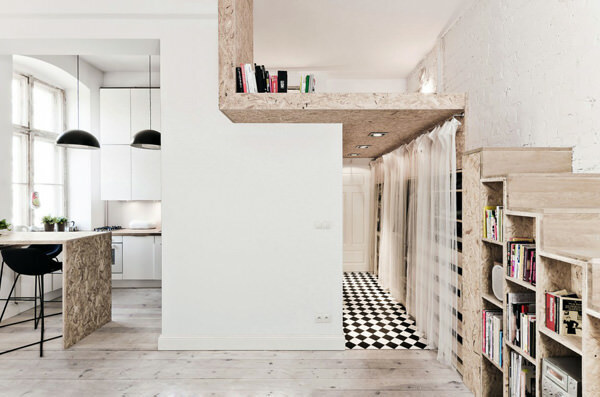 This entire apartment is only 29 square meters or roughly 312 square feet. The living room, kitchen and dining area are combined into one room while a huge bed area is built on an upper level 4.5ft high. 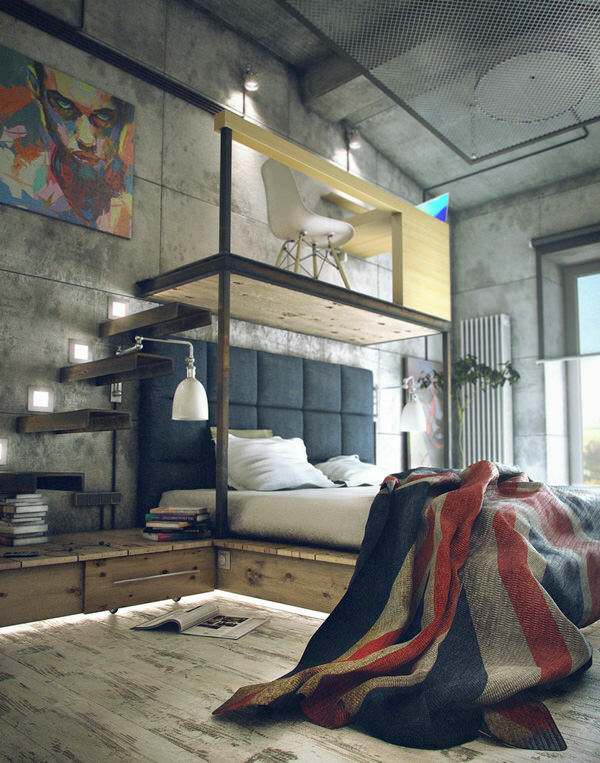 Suspended Bedroom. Rather than use an uncomfortable sofa bed in this small flat, the owner decided to suspend his bed, allowing full use of the floor space. The stairway to the bed can also lead you out to the large skylight atop the rooftop garden. Wooden Box Home. This is just the bedroom of a modern house with a bed and workdesk placed on top of ample storage shelves, a closet and the sink! 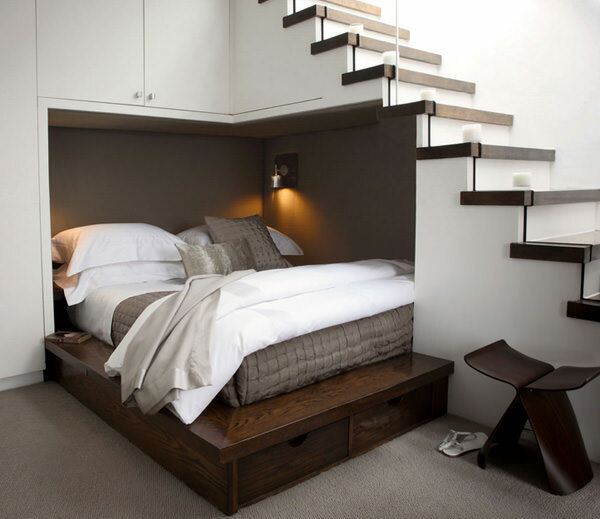 Bed Under Stairs. 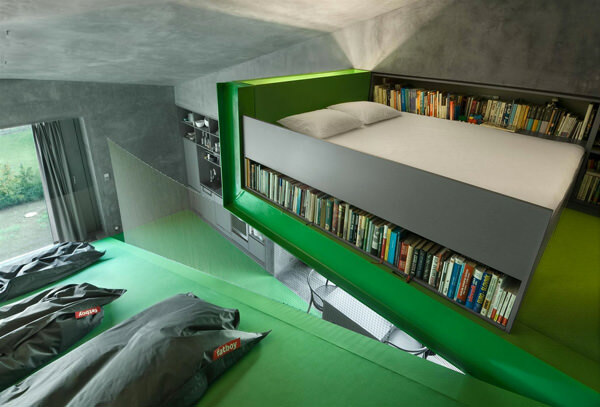 Harry Potter wouldn’t mind this bed under the stairs. Instead of storing random junk under it, these designers put a queen sized bed in the cozy corner, complete with a reading light. Tim Seggerman Loft. This Nakashima- (legendary woodworker and architect) inspired design was used to overhaul a single-room apartment in New York. Time Seggerman placed the sleeping area above the kitchen to fully utilize this 240 square foot apartment. Small Box House. It’s a tall house with strategically placed windows to make full use of natural light. The roof is upstairs while the kitchen and dining area is downstairs. Warehouse Loft. The long warehouse design allows for this loft to have a separated upper floor that was turned into a large bedroom and shower. Below, you’ll find an office with a living area and kitchen. San Diego Cadres. Architect Nathan Lee Colkitt reworked this 750 square foot space to house a living space and his firm’s office. He sleeps upstairs and work downstairs. Slope House. This house was built on a steep mountain slope in the outskirts of Černín, Czech Republic. 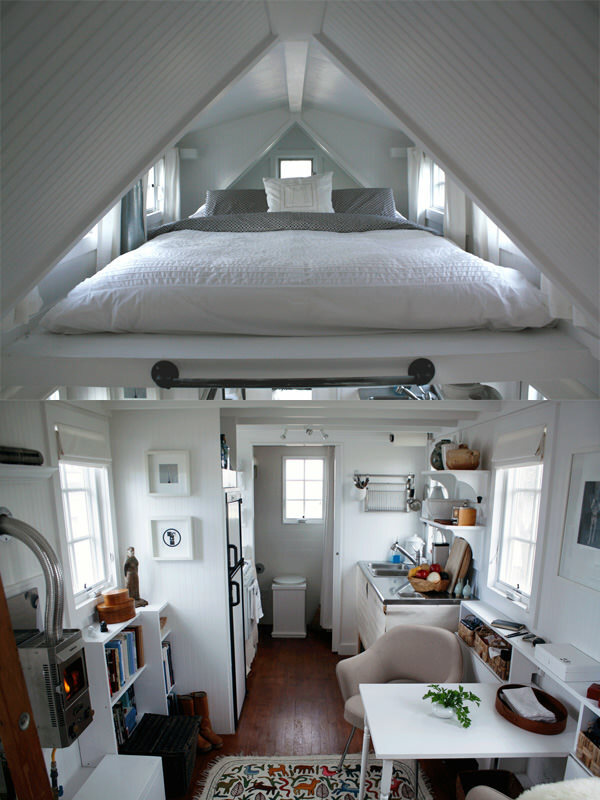 Top floor is a bedroom/library; at the bottom bunk beds and storage space. Both sandwich the living room and entrance to the home. 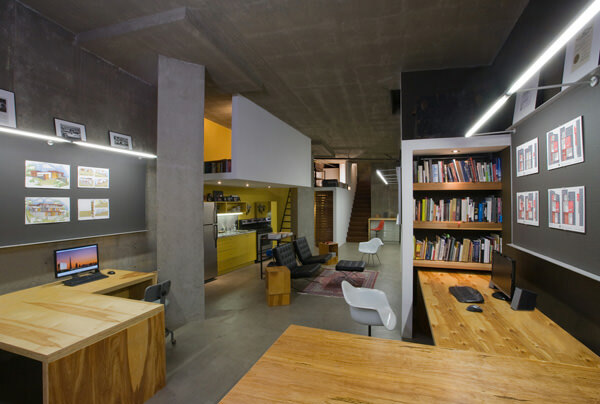 Maxim Zhukov Loft. Russian designer Maxim Zhukov turned this 3-room loft space into an open-space home for both work and rest. The Cube Project. This place is literally a box, with an area of 3m x 4m and height of 3m. However, you will find in here a kitchen, fully functioning toilet, 2 seater sofa with coffee table and a bed for 2. It also features solar panels on the roof to power the entire cube. Protohaus. 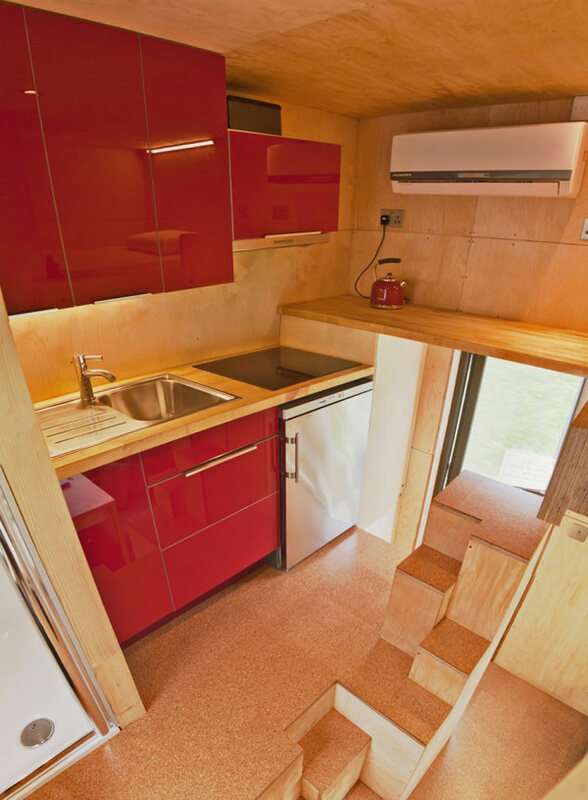 This house is only 125 square feet, and is actually a trailer. The bed is suspended near the roof, making room for other home essentials below. Puzzle Loft. The designer’s love for puzzles has given birth to the bedroom above the kitchen design, giving new meaning to breakfast in bed and sleeping in the kitchen. Zimmerman Garden Pavillion. The Zimmerman family turned architects and added a top floor for extra living space. All glass windows above glass doors provided ample light for the new floor. Some creations are better depicted through video. LifeEdited Apartment. It’s amazing how this tiny place can accommodate a dinner party of 12, 2 overnight guests in their own guest rooms, a home office and a mini home theater system. 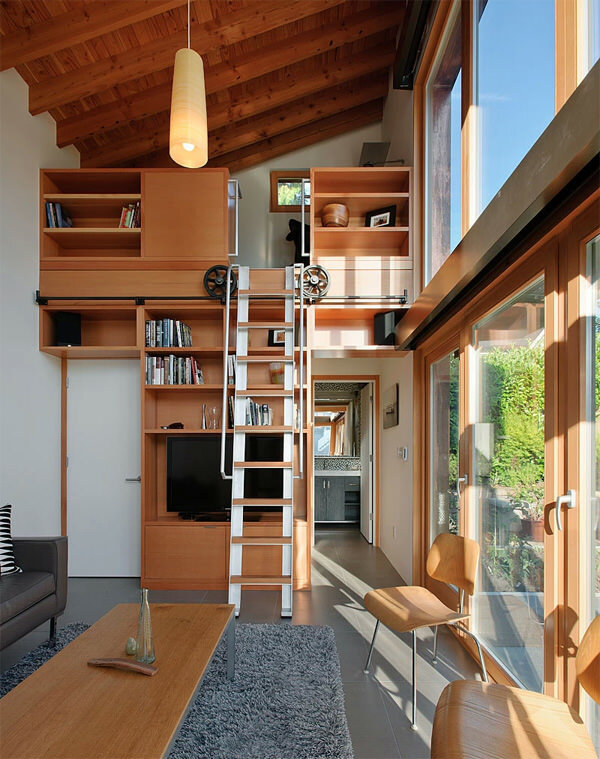 Makes you rethink what you can do with 420 square feet of space. LEGO-Style Apartment. Most of the appliances and furniture in this apartment is hidden from sight to create a minimal look. The bed, fridge, sink, oven and storage are placed behind wooden doors and in their own individual sections. Origami Apartment. The designers of this 400 square foot apartment had the idea of overlapping the different areas (bedroom, living room, kitchen) you would find in a typical home, hence the name Origami. The bed folds out of a big cabinet, while the cabinet doors act as a divider for the living room and as an office table. DIY Micro Apartment. This engineer’s game is all about efficiency in small spaces. Using this 182 square feet space, he was able to create 8 different spaces including a kitchen, dining area, cafe/lounge, a sleeping area and a guest bed above the bathroom. 24 Room Shoebox Apartment. This architect turned his 344 square feet apartment to incorporate 24 different ‘rooms’ with sliding dividers and hidden storage. Walls move about to reveal kitchen appliances that are stored away when not in use. There’s even a guest bed (somewhere) in there too.